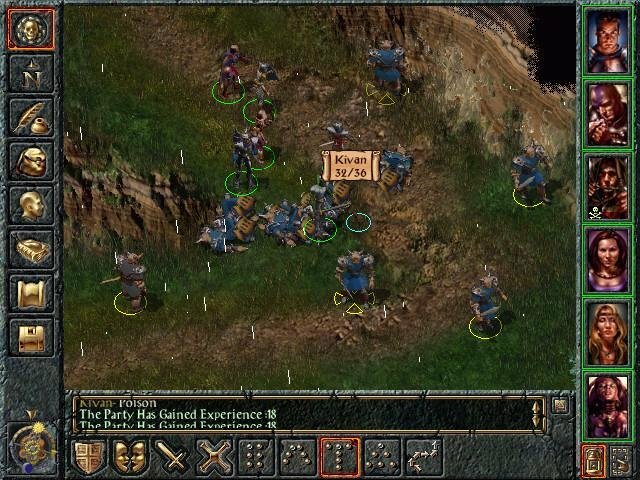 The grand-daddy of all open-world role-playing games stands before you. Let’s Party! The game’s party system at work. Remember the first time you played a roleplaying game, tabletop or otherwise, that drew you into a world so vast that your brain lost contact with the outside world, being utterly engrossed in the story before you? 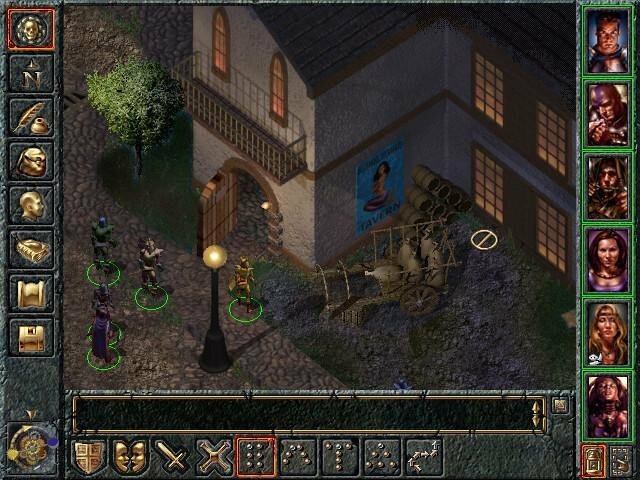 It’s rare that any game can garner that sort of dedication from unsuspecting players, but BioWare’s highly acclaimed Baldur’s Gate can pull this neat trick off quite easily once you get into it. 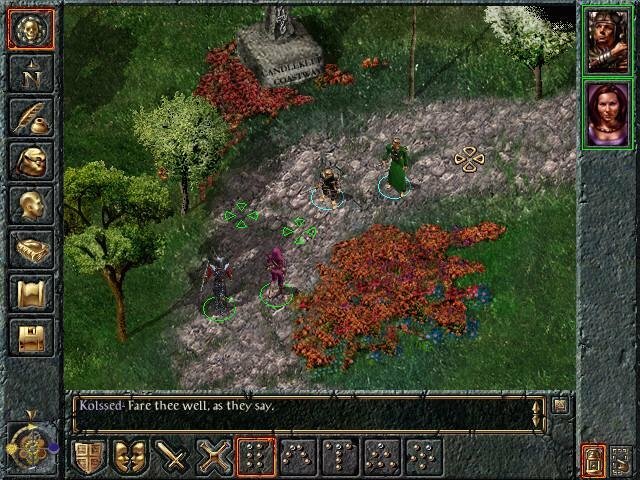 Set in the Forgotten Realms universe, Baldur’s Gate will astound even the most fanatical role player with its attention to detail, character development, storylines, combat and overwhelmingly vast game world. 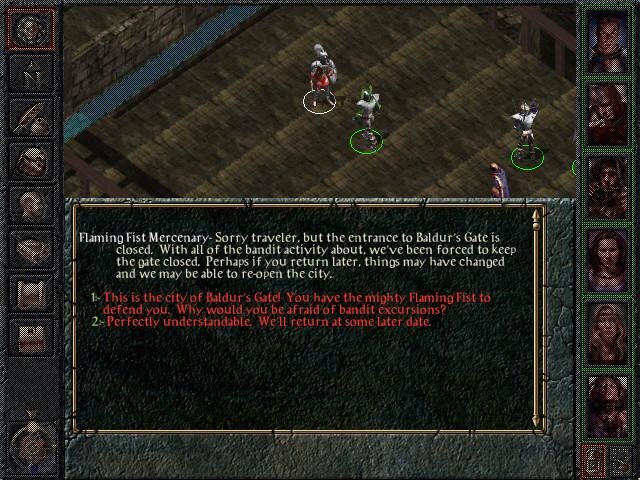 The game follows the AD&D rules as closely as you could hope for. 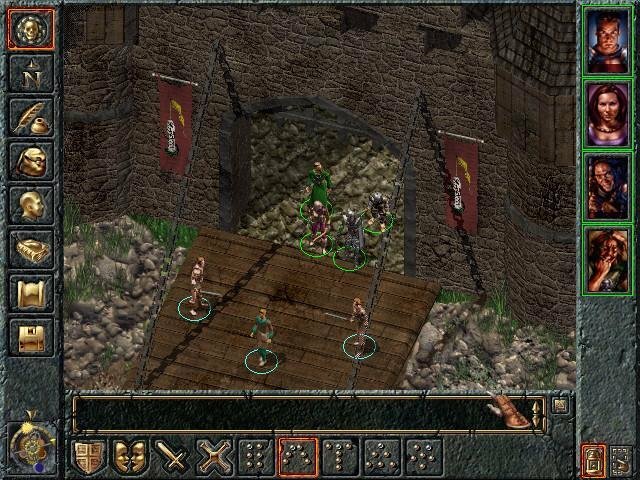 You start off by creating your main character – you choose gender, race, profession, weapon proficiencies and moral alignment. Even at this pre-game stage, plenty of thoughtful touches are evident – you can customize your character even further by importing a custom-built picture for his/her on-screen portrait, and even import your own dialog (saved as simple WAV files). 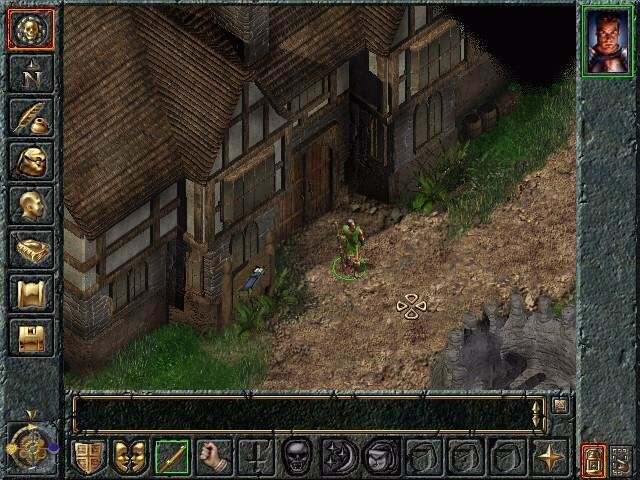 Once you’ve built your character, the game proper begins with you standing outside an inn in the scholastic city of Candlekeep. All you know at this stage is that your foster father, Gorion, wants you to outfit yourself for a journey, and then meet with him at the center of town. 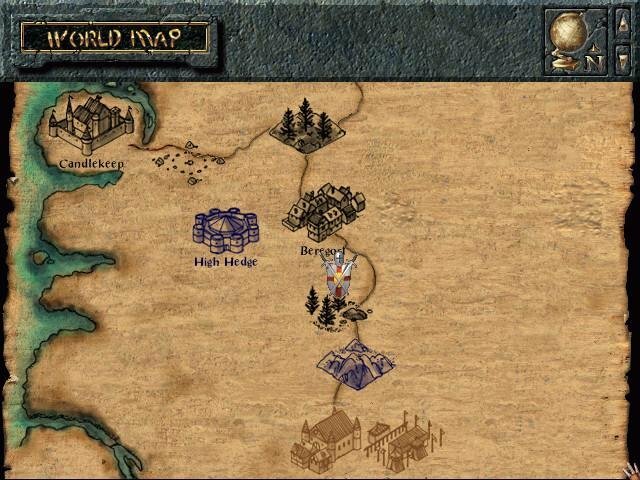 By exploring the city, you’ll run across several simple quests and fights that will prepare you for the big, bad world just outside the city gates. 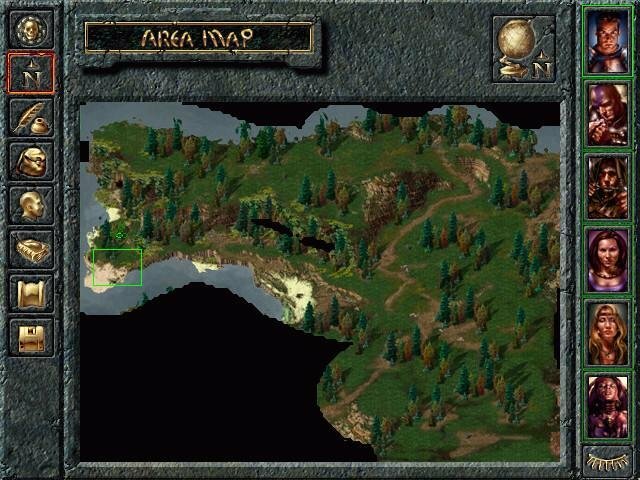 From this rather auspicious beginning, you depart on an adventure that will take you along most of the realm. 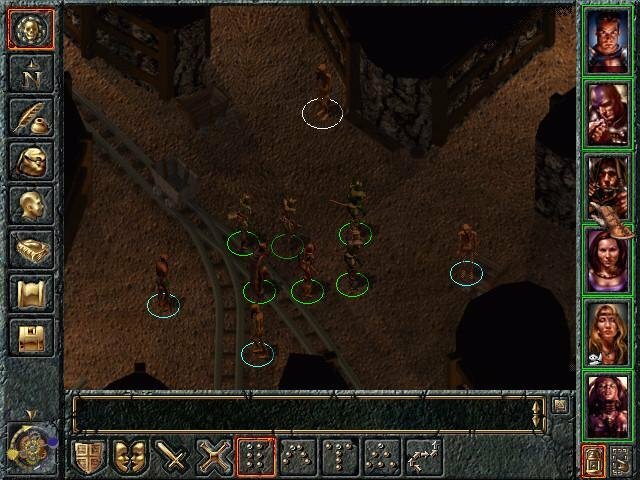 You’ll run into hundreds of NPCs, some of which are friendly and will join your party and others that will try to kill you outright. As you travel, you can let five more characters join your party, for a total of six adventurers. The action is viewed from a slightly skewed top-down perspective, and every background is hand-crafted, so the level of detail is astonishing. 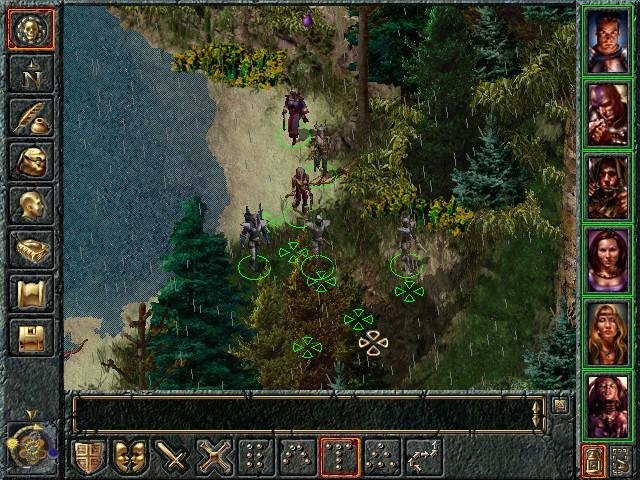 You move your characters about with a simple point-and-click system similar to a real-time strategy game. Actually, the real-time strategy comparison is a good one, since the game proceeds in real-time throughout (compressing an AD&D round that is normally 60 seconds into a game round six seconds long). However, at any given moment you can hit the spacebar to pause all the action. 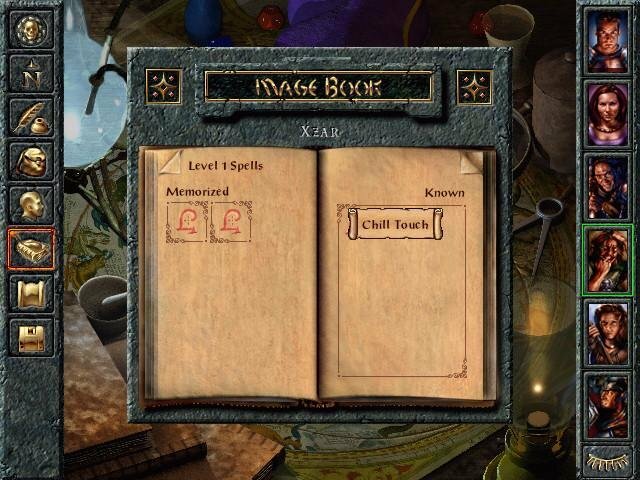 With game time frozen, you can check your characters’ status, issue commands, prepare spells, and plan strategies. Once you hit the spacebar to unfreeze the action, each character acts on the commands you gave them. You can also tailor the game to auto-pause after certain events, like when a character gets hit, spots an enemy, or ends their round. 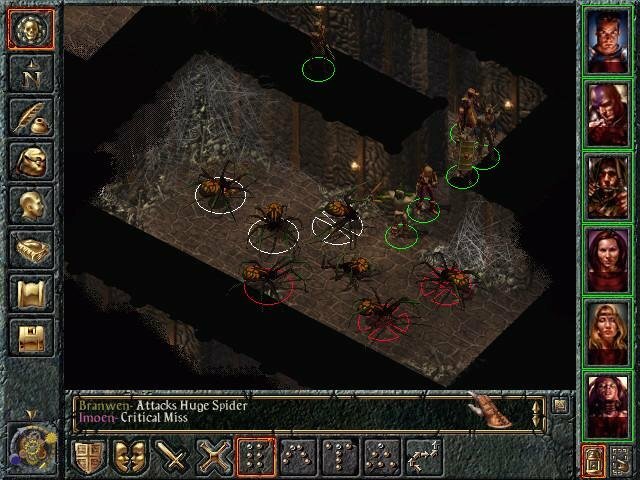 This system gives players great control over every aspect of their party during combat, but keeps things from slowing down every time there’s a fight. Strategy is a key element to combat, especially at the end of the game where players have to face some really tough opponents, and the pause feature lets players control every second of game time. Travel the world and barge into peoples’ homes. 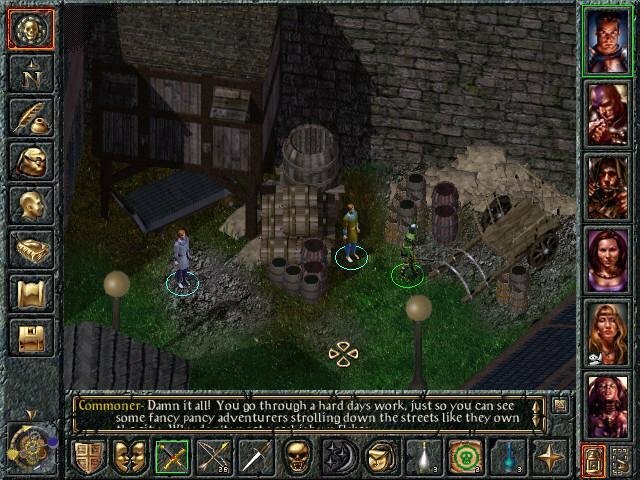 Some of the quests are your regular high-fantasy FedEx delivery assignments – fetch this woman’s ring or that dude’s pair o’ boots – but some of them are more interesting, like taking down a mad magician or finding and capturing a captain of the guard who’s gone insane. At times you have to make moral decisions that affect your reputation within the world. 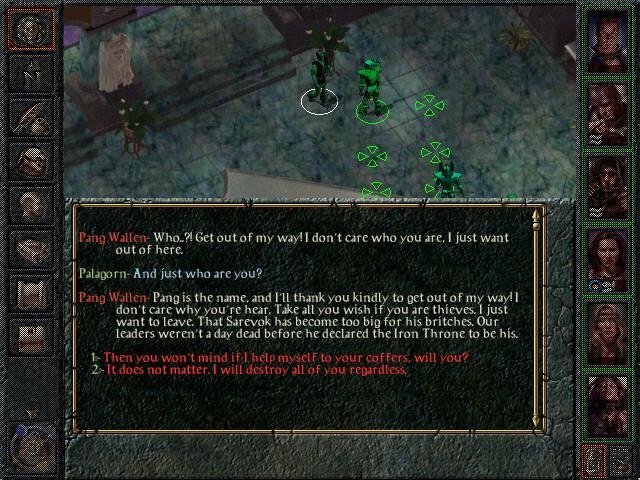 Your reputation determines how NPCs respond to you, and whether certain characters in your party want to stay with the group. It’s not difficult to imagine a sanctimonious Paladin might not want to fight alongside a Necromancer, and vice-versa. 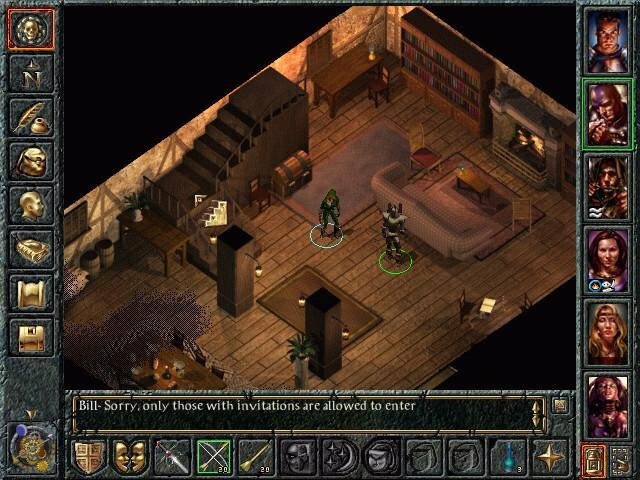 The game also contains another roleplaying first: multi-player options. Using IPX, TCP/IP, or serial connections, you can journey with as many as five friends through the single-player game. The host determines what characters the players control, whether they can initiate conversations, pause the game, etc. Also, when one character initiates dialog, every player suddenly switches to the same scene, even if they’re on the other side of the map. While it does a good job in making sure everyone sees what happens, it’s rather frustrating if you’re in the process of fighting or robbing someone. However, if you gather a few close friends together who are serious about playing, it can truly give a fresh spin on tabletop AD&D games. really wanted to play this classic. is this the full game? please answer as quick as you can! When you find out it’s a two hour download…. broken link, please go back up! Includes original expansion as well. I am having a problem when attempting to install the game. I have my c drive mounted and I am using the tutorial for running old games but whenever I type in “imgmount d c:\disk1.bat -t cdrom” I keep getting file not found message from dos. Am I doing something incorrectly? 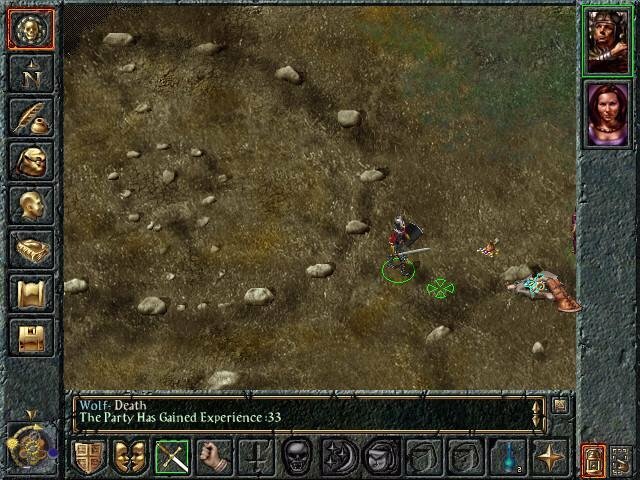 Is BG Disk1 not the correct virtual disk? Any help would be appreciated. 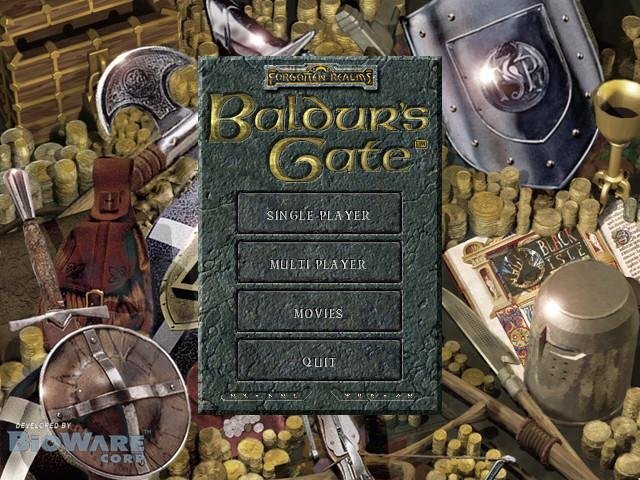 Baldurs Gate is a Windows game not a Dos game. 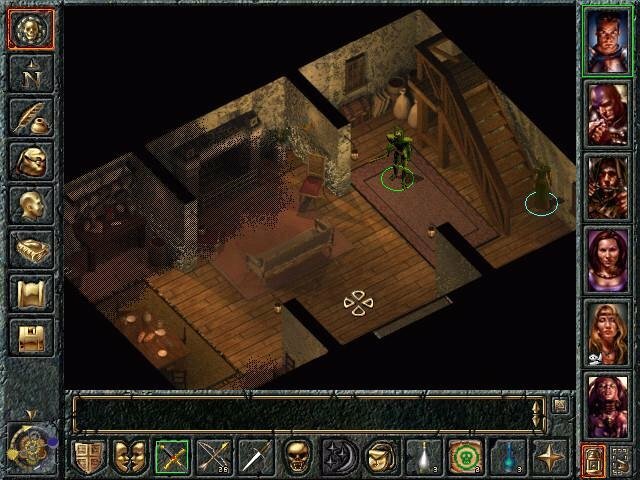 you can’t run windows games in dosbox. Install/run them in windows. see system requirements. For BG it says Windows95 minimum. Are both of the downloads isos? How does one install it? Ehi man, thanks for publishing this wonderful game. I have a problem though. I downloaded, un-zipped and mounted the first CD (BG disc1.bin) in a virtual drive. Then I launched the virtual CD, autorun started but I had a message of compatibility. Even if I clicked on “execute”, it didn’t work. any help? I posted it here, in appropriate game’s topic. 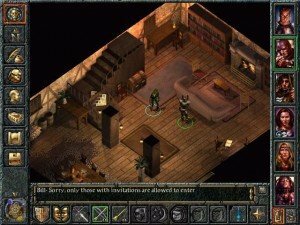 The link for downloading Baldur’s Gate strategy guide is broken, and Archive link gives only encrypted file. Yeah, I screwed that up and forgot to update it. 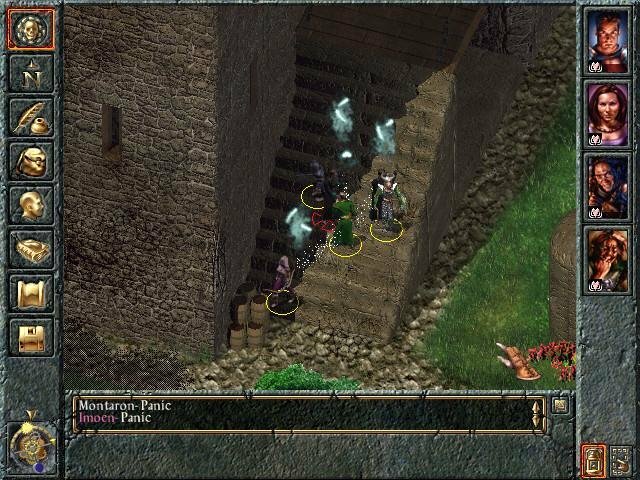 I had scans of my baldur’s gate guide but then my hard drive died, and i don’t have the time to redo all of it. It’s not a very detailed guide though, and is small (around 150 pages). So no guide for now. Congrats on your website and the astonishing job you do… Keep up and happy new year!